Last class of the school year starts 5/7! Next session in September. Sculpting FUNdamentals Enroll now to hold your space for this popular class. (Age 8-12) This 2-hour class is designed to provide exposure to fundamental art elements and principles essential across all art disciplines. 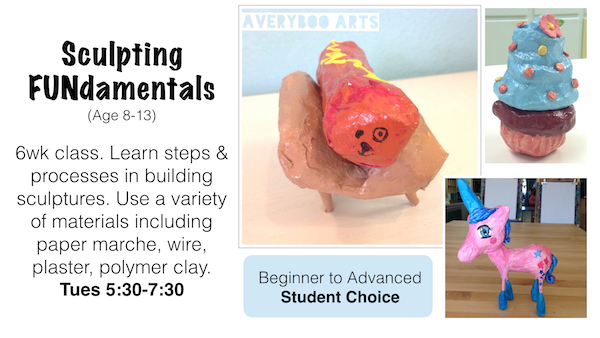 Students will conceptualize, design & build an armature; use either papier marche, plaster & or polymer clay to shape their piece & add details, then learn techniques in texture, color theory and painting to complete. * All new students will begin in Level 1 class. ** Level 3 may require additional material fees dependent upon students' artistic vision. - Please consult with studio before registering a younger student for this class. - Younger students who are disruptive may be asked to leave without refund. Cancellation policy There are no cancellations 7 days prior to the start of session. Because of the progressive nature of the class, it is recommended that students attend all classes. - There are no make ups allowed for this class. - No class credits or refunds will be given if student misses class. - Please notify staff prior to registration of any scheduling conflicts so we can work with you.